This is part two of my Top 10 favorite new technologies published in 2016, part one can be found here. So without further ado, here are the other five, again not listed in any particular order. Chimeric Antigen Receptors (CARs) expressed in T cells have been one of the hottest areas of biotechnology in the past few years. CAR-T cells have initially been used to recognize and kill all (CD19+) B cells as a treatment for a number of B cell malignancies. However, CARs have the potential to be much more versatile than simply targeting tumor antigens. Their core properties are a recognition domain and a signaling domain, so they could theoretically be applied to many more applications. For instance, some have tried to engineer FVIII reactive CARs into regulatory T cells to suppress inhibitor antibody development during enzyme replacement therapy for hemophilia (link). 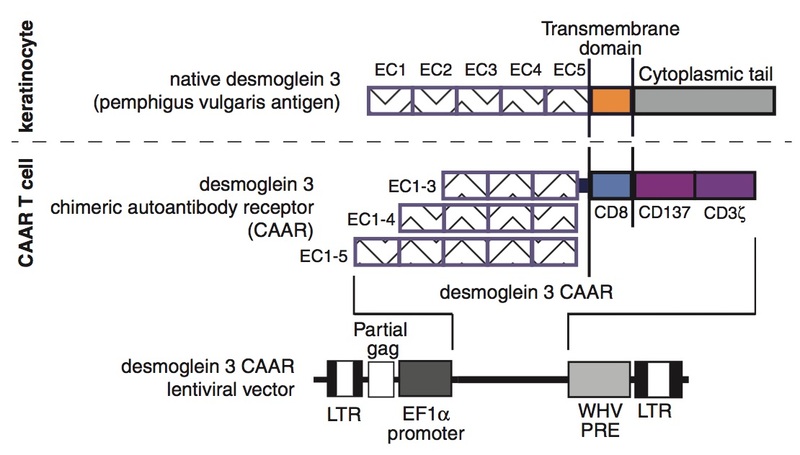 The authors demonstrate that these CAAR-T cells are able to lyse B cells expressing anti-Dsg3 B cell receptors, even in the presence of anti-Dsg3 antibodies. They also tested the cells using in vivo mouse models by injecting anti-Dsg3 secreting hybridomas, and found the CAAR-T cells were able to significantly reduce anti-Dsg3 titers and protect against skin disease. Further, these CAAR-T cells had no apparent toxicity to normal human skin xenografts. PV is a potentially fatal autoimmune skin disease caused by these autoantibodies. One current treatment approach is to broadly deplete B cells with Rituximab, which causes high remission rates, but often patients relapse. Additionally, this broad depletion of B cells potentially raises the risk of infection. Thus, targeting just the B cells involved in the disease is an attractive approach, and if the CAAR-T cells remain in patients long term, it may provide a more lasting response, or even a cure. This paper is a nice example of a creative use of chimeric antigen receptors outside of cancer. Their approach shows promise in a severe disease, and also could potentially be applied to other autoantibody-mediated diseases. Kinase inhibitors, such as imatinib, crizotinib and erlotinib, can induce significant tumor regressions in a high percentage of patients with tumors driven by the targeted kinase. Unfortunately, these regressions can be transient, and mutations in the target can occur that reduce the activity of the inhibitor. In the case of EGFR activating mutations, such as the L858R mutation or exon 19 deletions, these can confer sensitivity to EGFR inhibitors. However, secondary mutations, such as T790M limit the activity of these inhibitors. Next generation inhibitors that can inhibit EGFR T790M have been developed, with Osimertinib recently being approved. Unfortunately, resistance arises against these inhibitors as well, with the C797S mutation identified as being able to inhibit the activity of T790M inhibitors. In this paper, scientists at Novartis screened a large library of compounds for the ability to inhibit EGFR (L858R/T790M) but not inhibit wild-type EGFR. They identified a compound that inhibited EGFR in a novel way from all the previous EGFR inhibitors, which typically bind directly in the active site of the enzyme. 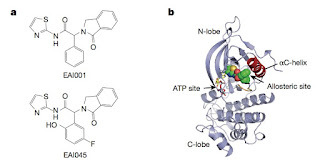 This allosteric inhibitor (shown below) binds in a separate site, which is potentially advantageous, because the mutations that prevent activity of other EGFR inhibitors may not have any effect on this novel molecule. Impressively, they found that this compound did, in fact, have activity against the new C797S mutation that currently makes EGFR insensitive to all T790M inhibitors. This novel inhibitor did not appear to have activity against EGFR with exon 19 deletions, so potential future clinical trials using compounds based on this molecule will most likely focus only on other EGFR activating mutations. 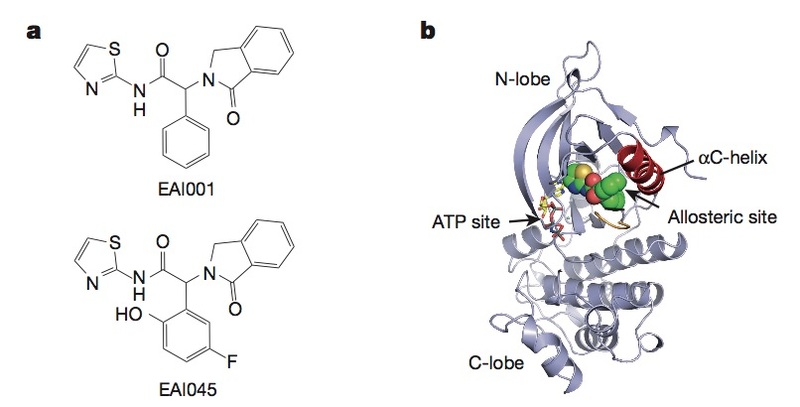 In addition to being able to target the latest resistance mutation in a key target, I am excited by this approach because allosteric inhibitors potentially have non-overlapping resistance mechanisms. Thus, if one could combine treatment with other EGFR inhibitors, this may delay resistance as any individual tumor cell would have to simultaneously be resistant to both inhibitors to survive. Novartis has a similar allosteric inhibitor approach for the BCR-ABL gene fusion in CML, which is usually effectively treated with kinase inhibitors, but resistance mutations can occur. That allosteric inhibitor, ABL001 has shown activity in CML patients who had become resistant to other inhibitors (link). Additionally, one of my favorite people on twitter, Tom Marsilje (@CurrentIncurSci), is one of the authors of this paper. Steve Rosenberg's lab at the NCI has been one of the major drivers of research on how a patient's own T cells can recognize tumor-specific mutations and be used as a therapeutic against cancer. Through work using tumor-infiltrating lymphocytes (TILs) and expanding tumor-reactive TILs ex-vivo, his group has achieved impressive results in patients with melanoma. Further, it appears that the primary activity of these TILs are against patient-specific mutations that form neoantigens T cells can recognize (link). However, difficulties remain in generalizing this research - to generate TILs, for direct use or identification of neoantigen-reactive TCRs, one needs access to significant amounts of tumor tissue. Additionally, it is unknown if neoantigen-reactive T cells will be present in tumors with lower mutational burden than melanoma. Two papers from the Rosenberg lab addressed these questions this past year. Previous work by the Rosenberg lab had identified the inhibitory receptor, and checkpoint blockade target, PD-1 as being elevated specifically on the neoantigen-reactive T cells in the TIL population. Here, they asked if this biomarker may allow the identification of neoantigen-reactive T cells from peripheral blood, which is much more easily accessible and less invasive than using tumor tissue. Studying four melanoma patients, they were able to identify neoantigen-reactive T cells from peripheral blood against at least one, and sometimes multiple, neoantigens in three of the four patients. The TCRs identified from these neoantigen-reactive T cells when transduced into autologous T cells were able to redirect cells to recognize the patient's tumor. To identify which of the PD-1+ T cells are actually reacting against specific neoantigens, you do need to have at least sequencing data from tumor cells to predict potential neoantigens and screen T cells for reactivity against them. While this could limit the benefit of having a non-invasive source of tumor-reactive T cells, the use of less invasive (circulating tumor cells, needle biopsies) or archival tumor samples, still makes the ability to access tumor-specific T cells from peripheral blood an important advance. Identification of these tumor-specific T cells could allow either the expansion of these cells and reinfusion into the patient, or the identification of TCRs that could be used in a (typically) patient-specific engineered TCR therapy. Numerous companies, such as Neon Therapeutics and Kite Pharma (CRADA with NCI/Rosenberg), are interested in identifying neoantigen TCRs for personalized T cell therapies. This second paper (Dec 2015, but we'll sneak it into 2016) addresses the question of whether TCR identification approaches from TILs can be generalized to tumors with low mutation burden that may not have a robust endogenous immune response. 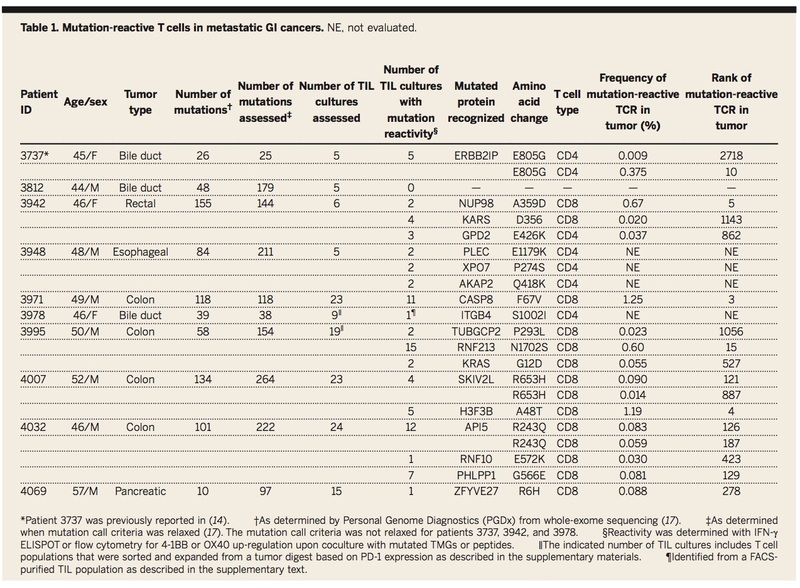 Here, Rosenberg's team looked at 10 patients with various gastrointestinal (GI) tumors to see if they could grow TILs from their tumors and identify neoantigen-reactive subsets. In 9 of the 10 patients they were able to identify neoantigen-reactive TILs that were often only present as a small percentage of the TIL population (below). 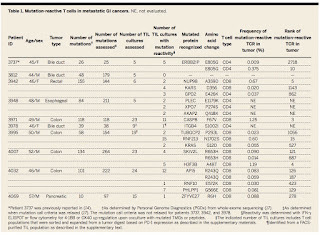 Impressively, even a tumor with as few as 25 mutations produced mutation-specific T cells. 4 of the 10 patients received TILs enriched for the neoantigen-reactive subset, and one has had a response lasting >20 months (that patient's TIL treatment was the focus of a previous publication here). This result shows that the endogenous immune response, even in tumors thought to be less immunogenic than the tumor types that typically respond to immunotherapy, can still recognize the tumor. This opens the door for improved approaches to harness this response in these cancers. Since the majority of mutations in a tumor are most likely passenger mutations with no selective benefit to the tumor, the majority of neoantigen-reactive T cells are likely to target these mutations and are expected to be patient-specific. However, one patient, 3995, had T cells that reacted against a driver mutation, KRAS G12D. Targeting this mutation, and other driver mutations with T cells is the focus of the next group of papers, below. Taking off directly from the last paper, the identification of TILs with TCRs that can recognize driver mutations has a number of implications. Targeting driver mutations (as opposed to passengers) are appealing for a number of reasons. Specifically, since they are important for maintaining the tumor phenotype, it would be more difficult for the tumor to lose the mutation compared to passenger mutations. Additionally, as a driver-reactive TCR could be used across the multitude of patients whose tumors contain this mutation and share the same HLA allele the mutant peptide is displayed on. This contrasts again to passenger mutations, where the TCR recognizing the neoantigen needs to be identified and cloned into an expression construct for each patient individually. Below are a number of examples of different recent attempts to use T cells recognizing driver mutations as therapeutics in cancer. The paper in the previous section by the Rosenberg group identified KRAS G12D-specific TILs from a colorectal cancer patient. KRAS mutations are common across many cancers (below), however, it is generally considered an undruggable target with small molecules, so identifying novel ways to target these mutations is an exciting development. The previously mentioned patient, 3995, was infused with the TIL product, but it only contained 0.002% T cells that recognized the KRAS G12D mutation, and that patient did not have a response after TIL therapy. They identified another colorectal cancer patient also with multiple T cell clonotypes that specifically recognized this KRAS mutation. That patient's treatment with these TILs is the subject of this paper. 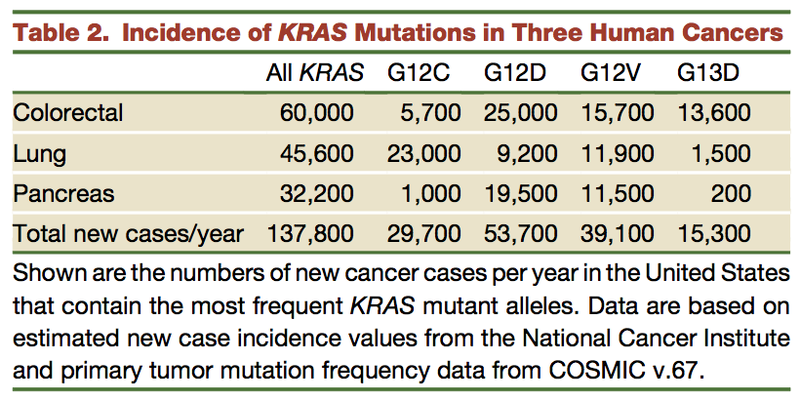 ~75% of the TIL product recognized the KRAS G12D mutation. 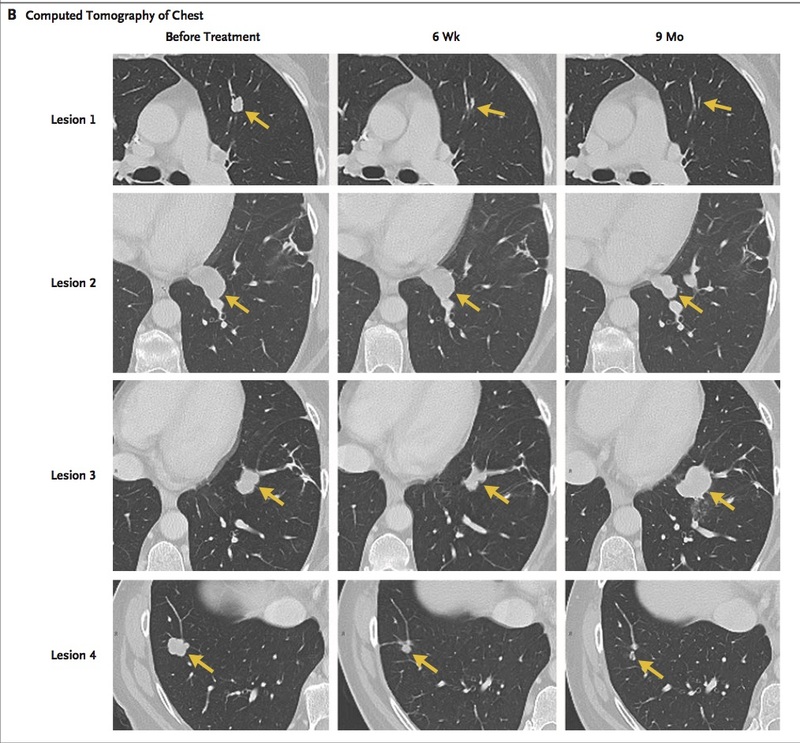 This patient had 7 metastases, all of which had objective responses, however one began to progress 9 months later, shown below. That lesion (#3) was removed surgically, and interestingly, but frighteningly, was found to have evidence of losing the HLA allele (HLA-C*08:02) the mutant peptide was being displayed on. This again shows the powerful ability of tumors to rapidly evolve in the face of selective pressures, whether they are small molecules or T cells, as I detailed in a previous post. However, this patient report is equally, if not more, promising, as it raises the possibility of using this TCR in other patients with the G12D mutation and HLA-C*08:02. Additionally, if an effective TCR recognizing a common KRAS mutation can be found, there is reason to believe that we may be able to identify TCRs that can recognize many more driver mutations as well. The authors state that the HLA-C*08:02 allele is found in 8% of white and 11% of black individuals, and thus that there is a potentially large population (thousands) of patients who could be amenable to this TCR. However, in a letter to the editor, there seems to be some debate if truly that many patients exist who would have both the right HLA allele and the KRAS G12D mutation. Others at the NCI have tried to identify TCRs against the more common HLA-A*11:01 allele, present in 14% in Caucasians and 23% in Asian-Americans, by immunizing HLA-A*11:01-transgenic mice with KRAS G12D and G12V mutant peptides (link). They were able to identify TCRs that appeared to specifically recognize the mutant peptide, but not wild-type, and had activity in xenografts of cell lines that contained the mutation. Since these TCRs were generated in the mouse, and not from patients, in my mind they are still significantly less validated in their safety and efficacy compared to the TCR identified from the patient. However, further investigation of these TCRs is warranted. Kite Pharma has licensed KRAS targeting TCRs from the NCI, however, I am currently unclear as to which specific TCRs they licensed. It has previously been shown that BCR-ABL-specific T cells can be found in patients with this fusion mutation (Ph+ CML & ALL), and their presence correlates with clinical response to kinase inhibitors. In this new paper, the authors attempted to treat 3 Ph+ ALL patients with measurable disease with autologous or allogeneic (from donor post-allogeneic transplant) BCR-ABL-specific T cells. They identified and expanded these T cells from peripheral blood by coculturing with dendritic cells pulsed with BCR-ABL peptides. All three patients had measurable disease and were on a stable course of TKIs prior to infusion. Patients were treated with multiple infusions of T cells, and each patient achieved a molecular or hematologic complete remission post infusion. One patient had their TKI switched from imatinib to nilotinib to ponatinib, during treatment and likely played a role in the response as well. There was also no significant toxicity from the treatment besides grade II skin GVHD in one patient that resolved, and who had had a previous allogeneic transplant. Although only 3 patients were treated, this report suggests expanding and infusing BCR-ABL-specific T cells from patients or donors can be an effective strategy in Ph+ ALL patients. Alternatively, BCR-ABL-specific TCRs could be used to make engineered TCR products instead of using endogenous T cells. These results further demonstrate the possibilities of targeting shared driver mutations using mutation-specific T cells. They tested this on animals with normal limb function to learn the pattern of brain activity and nerve firing. 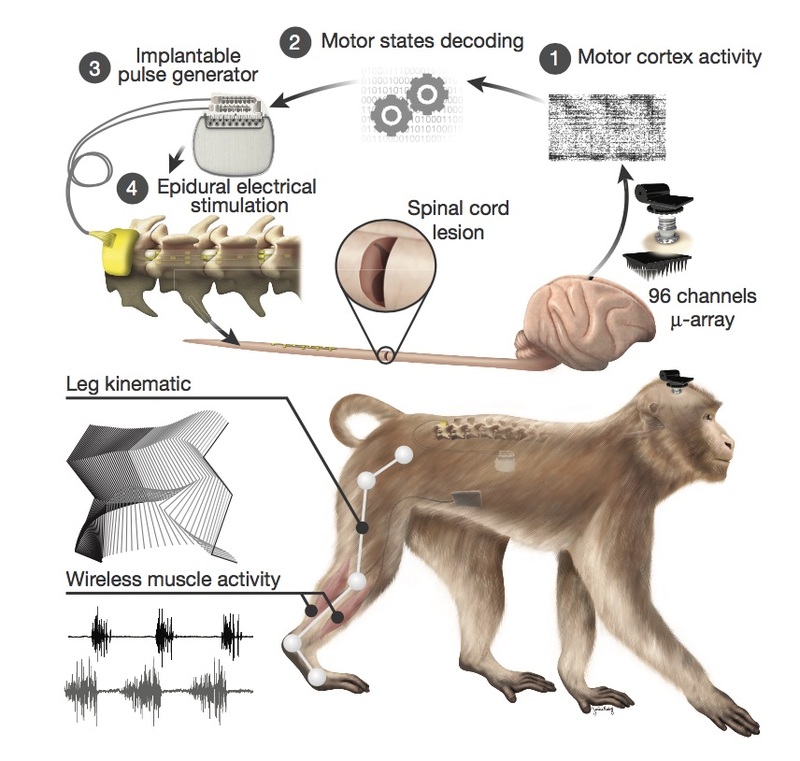 They then implemented this system in animals with one limb paralyzed, and used the information from normal walking to decode when the brain was trying to tell the spinal circuits to fire. They could activate the computer interface to induce the stimulation of these neurons and induce the appropriate timing of muscle activity to allow normal walking. A video (viewable without paywall) describes the approach better than I can and shows the impressive results and it's worth a look. Apparently, all of the components have individually been approved for investigational use in humans, so a potential human trial may not be that far away. There were many other interesting papers from 2016 that I could not fit into this list of 10, so I've listed a whole bunch more below. MTAP deletion confers enhanced dependency on the PRMT5 arginine methyltransferase in cancer cells (Two papers: link 1, link 2). - I like the concept of targeting the effects of genetic deletion of genes - since you cannot gain them back. A couple other papers with a similar approach of targeting passenger gene deletions (link 1, link 2). Pathological α-synuclein transmission initiated by binding lymphocyte-activation gene 3 (LAG3) - (link). - Interestingly links α-synuclein involved in neurodegenerative disorders to LAG3, a cancer immunotherapy target. Proteasome inhibition for treatment of leishmaniasis, Chagas disease and sleeping sickness (link). - A novel target for a number of poorly treated infectious diseases. Also discussed in Derek Lowe's In the Pipeline blog (here). Programmable editing of a target base in genomic DNA without double-stranded DNA cleavage (Two papers: link 1, link 2). - One of the drawbacks of current gene editing approaches (CRISPR etc.) is the creation of potentially dangerous double-stranded breaks. These methods allow the modification of bases without cutting DNA, although there are limitations to this approach as well. Autoimmune manifestations in aged mice arise from early-life immune dysregulation (link). - Intriguing paper suggesting that (at least in mouse models) early intervention in autoimmune diseases (using an anti-CD40 antibody, here) can have a more profound impact on preventing later autoimmune sequelae. FVIII-specific human CAR T-regulatory cells suppress T-and B-cell responses to FVIII (link). - Putting CARs into regulatory T cells to suppress autoimmune diseases, here preventing inhibitor antibody formation in hemophilia. Correcting mitochondrial fusion by manipulating mitofusin conformations (link). - Mitochondrial fusion dysfunction is central to diseases such as Charcot-Marie-Tooth disease 2A, but modulating fusion has not previously been possible. The authors engineered a cell-permeant minipeptide that can correct the cause of CMT2A disease in cells. Inhibition of ileal bile acid uptake protects against nonalcoholic fatty liver disease in high-fat diet–fed mice (link). - Bile acids are interesting targets for nonalcoholic fatty liver disease, and this paper used a small molecule that remodeled bile acid composition and had beneficial effects in a mouse model of NAFLD. A “Trojan horse” bispecific antibody strategy for broad protection against ebolaviruses (link). - Novel use of bispecific antibody technology to target antibody to cellular compartment (late endosomes) where they can effectively bind and inhibit ebolavirus proteins. A Genome-wide CRISPR Screen in Toxoplasma Identifies Essential Apicomplexan Genes (link). - Uses the power of a CRISPR knockout screen to identify novel essential Apicomplexan (group of parasites including those that cause malaria and toxoplasmosis) genes and potential future drug targets. Factor XIa–specific IgG and a reversal agent to probe factor XI function in thrombosis and hemostasis (link). - Suggests targeting Factor XI might be a safer anticoagulant target with less bleeding risk (as currently being pursued by Ionis/Bayer). Potentiating the antitumour response of CD8+ T cells by modulating cholesterol metabolism (link). - Identifies a novel target for improving T cell activity, potential to target it systemically or directly by modifying cells used in T cell therapies. Chronic administration of an HDAC inhibitor treats Niemann-Pick type C disease in a mouse model (link). - NPC is a severe and rare lysosomal storage disease with no current disease modifying treatments, this study suggests HDAC inhibition may be worth further investigation as a potential target. Expanding antigen-specific regulatory networks to treat autoimmunity (link). - Nanoparticles coated with autoimmune peptides bound to MHCII reduce autoimmune disease in a number of mouse models. Allele-specific inhibitors inactivate mutant KRAS G12C by a trapping mechanism (link). 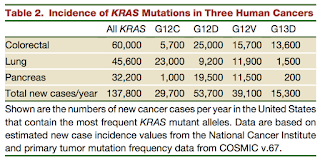 - KRAS mutations are generally considered "undruggable" (read: difficult to drug), but this paper shows that KRAS G12C mutations actually allow for sensitivity to drugs that bind to KRAS in its inactive state, suggesting a potential therapeutic approach for these mutations. - Identifies CD46 as a potentially interesting target in multiple myeloma and shows activity using an antibody-drug conjugate in xenografts. Theranostic barcoded nanoparticles for personalized cancer medicine (link). - Uses nanoparticles containing different cancer drugs and DNA barcodes, the authors developed a system to test multiple drugs directly in vivo to determine which drug will be the most effective. CRISPR/Cas9 β-globin gene targeting in human haematopoietic stem cells (link). - Were able to correct β-globin mutations in human HSCs using CRISPR, and to enrich for corrected cells by using a reporter in the homologous recombination template. NHEJ-based CRISPR gene insertion (link). - Homologous recombination based gene editing is less efficient than non-homologous end joining (NHEJ) based editing, and is thought to only be usable in dividing cells. The authors developed an approach, using microhomology templates and CRISPR to use NHEJ based editing to insert genes at high efficiencies and in non-dividing cells. IgG-Fc Trimer potent inhibitor of immune complex induced autoimmunity (link). - Activation of the Fcγ receptor by autoantibody immune complexes can play a role in autoimmune disease pathogenesis. The authors identified a trimer configuration of Fc constructs to bind the receptor without inducing its activation, and potentially serves as a specific way to inhibit this pathogenic interaction present in autoimmune diseases. Nanobodies that block gating of the P2X7 ion channel ameliorate inflammation (link). - ATP released by dying cells can contribute to autoimmune and inflammatory diseases. The authors were able to use nanobodies to block ATP binding to ion channel P2X7, and had efficacy in mouse models of inflammation. Disclosure: I have no positions in any of the companies mentioned.